Wednesday, January 21, 2009 Posted by Stephanie H.
The Mirage Stone is one of the premiere outdoor fireplaces on the market today. 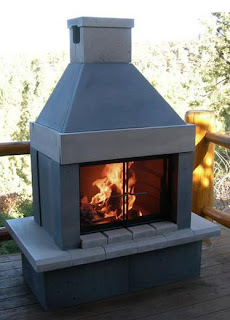 This outdoor fireplace features an interlocking construction which allows for quick and easy assembly. There is no need for any mortar or metal fasteners. This first-class fireplace features a strong, heat dissipating stone that avoids any problems associated with concrete and cement based mixes when they are exposed to extreme temperatures. The Mirage Stone outdoor fireplace has a number of options that will allow you to customize it to fit almost any décor. There are six stunning finishes to choose from, along with five different handle design options. With its powder coated steel door system, the Mirage Stone outdoor fireplace can bear all weather conditions, including the rain and snow. This resilient concrete fireplace, made right here in the U.S.A., will not become cracked or damaged from unpleasant weather. This elegant and classic outdoor fireplace is available in two different models – a standard model, and also in a see-through model. The standard model is only open on one end, and is similar to a “typical” fireplace. The see-through model is open on all four sides, which includes a mesh screen on each of the open areas. The Mirage Stone outdoor fireplace can burn charcoal, wood, and natural or propane gas. The wood burning unit comes with an adjustable height bbq grill. There is also an optional gas log set is available for the use of natural or propane gas. This outdoor fireplace is beyond exceptional. It’s great for hanging out and staying warm outside with your family and excellent to have while entertaining guests. This concrete beauty will quickly become the center of attention in your backyard. You will be able to enjoy the warmth and atmosphere of a campfire without the smoke and hazards of an open flame. The beauty and durability of the Mirage Stone fireplace will create a lasting addition to your outdoor living space.